The Montreal Canadiens Children’s Foundation has inaugurated its ninth BLEU BLANC BOUGE outdoor rink in Ahuntsic-Cartierville. Montreal (December 13, 2017) – The Montreal Canadiens Children’s Foundation unveiled its ninth outdoor multipurpose and refrigerated rink today at Parc De Mésy in Montreal's Ahuntsic-Cartierville borough, as part of the BLEU BLANC BOUGE program presented by Canadian Tire Jumpstart Charities (Jumpstart). Announced in the summer of 2016, this rink was constructed in part to commemorate Montréal’s 375th Anniversary and the National Hockey League Centennial, and is funded in part by the Montreal Canadiens and the NHL/NHLPA Industry Growth Fund. To mark the official opening, Canadiens Alumni and current players of the team were on hand to skate with the young Ahuntsicois. “The Foundation and the Montreal Canadiens family are proud to offer this ninth BLEU BLANC BOUGE community rink to the City of Montreal on the occasion of its 375th anniversary. This new quality infrastructure represents a unique and permanent legacy to the city in which both our Club and the League were founded 100 years ago. It will provide the borough of Ahuntsic-Cartierville with an additional playground that will allow children in the neighborhood to discover the pleasures and benefits of a healthy and active lifestyle while practicing various sports on our rink all year round,” said Canadiens Owner, President and CEO Geoff Molson. Canadian Tire Jumpstart Charities was named presenting sponsor of the BLEU BLANC BOUGE program at the start of the 2014-15 NHL season. Through its annual contribution of $230,000, Jumpstart joins the Montreal Canadiens Children’s Foundation efforts in offering opportunities so kids in less privileged areas can enjoy the benefits of sports and physical activity. “Access to sport and play gives kids an opportunity to get active, gain confidence, and have fun. Jumpstart is proud to partner with Bleu Blanc Bouge and the Montreal Canadiens Children’s Foundation because we believe all kids deserve the opportunity to play and grow, and the new rink will provide the community a space to do just that,” said Scott Fraser, President of Canadian Tire Jumpstart Charities. “Sport has always been a part of my life and continues to be an essential part of a successful week. That's why I am particularly proud to take part in the inauguration of the ninth Bleu Blanc Bouge outdoor rink. Thanks to this quality equipment offered by the Canadiens Children Foundation, I am convinced that people of all ages from Ahuntsic-Cartierville and the surrounding area will feel the urge to move more. Access to this new multipurpose and refrigerated outdoor rink will directly contribute to a more active lifestyle and improved health for Montrealers. We are pleased to be able to count on partners like the Canadiens Children Foundation to help us democratize sports and encourage the public to participate,” said Mayor of Montréal, Valérie Plante. “This rink is part of a collective effort to revitalize an entire area of Cartierville. The Ahuntsic-Cartierville borough is working with several partners to achieve this objective. The presence of the BLEU BLANC BOUGE rink and of the Cartierville YMCA, as well as the future development of the Bordeaux-Cartierville Community and Cultural Center, will greatly contribute to improving the quality of life of the residents of the area,” said Mayor of the Ahuntsic-Cartierville borough, Émilie Thuillier. This new ice rink is located in the heart of the Laurentien-Grenet integrated urban revitalization (RUI) area, in the Bordeaux-Cartierville borough. One of their priorities is the development of sports and cultural infrastructures in order to bring the community together around physical activity and therefore help disadvantaged youth to be more active by improving their access to sport. In addition, the implementation of this BLEU BLANC BOUGE rink is in line with several municipal orientations and is part of the Montréal Physically Active Action Plan, which works to create environments conducive to a physically active lifestyle and to the reduction of social inequalities in health. The initiative is part of BLEU BLANC BOUGE, the Foundation’s flagship project, with a total of nine ice rinks built to this day. The outdoor multipurpose and refrigerated community rinks are located in less privileged neighbourhoods: six in the Montreal area, one on Montreal’s South Shore, in Longueuil, one in Laval, on the North Shore, as well as another one in Sherbrooke, in the Eastern Townships. The opening of a 10th rink in Trois-Rivières is also scheduled for this winter. Committed to providing high quality infrastructures, the Foundation works closely with a vast array of local entrepreneurs and experts in various fields. All nine community rinks are vibrant gathering areas for sports and physical activity that provide a unique opportunity to discover a healthy and physically active lifestyle to youth from these communities. To ensure the success of this program, the Foundation formed a dynamic partnership with Québec en Forme, sharing the ultimate goal of improving the health of children living in underprivileged areas. As an organization promoting the well-being of children, Québec en Forme works closely with the Foundation in selecting community programs and districts to implement the program at the facilities and assess the program’s impact. “Québec en Forme applauds this ninth initiative of the Montreal Canadiens Children's Foundation, which once again promises to be very positive for the underprivileged community where it is deployed. These infrastructures allow young people to be active every day, which is a healthy habit that, if acquired early, will often be preserved as they grow into adults. I am proud that our expertise as well as our strong, committed and engaged network of partners can be used to facilitate such fabulous projects,” added Québec en Forme’s General Manager Eric Lamothe. Built in accordance with NHL standards and dimensions (200 feet by 85 feet) and featuring professional rink ice quality, the BLEU BLANC BOUGE rinks are versatile enough to be used for a variety of other sports during the year. The new Parc De Mésy facility will be predominantly used for ice hockey during the skating season, which runs from the end of November until mid-March, but the rinks also become an ideal playground for disciplines such as basketball, soccer, ball hockey and other types of games from spring to fall. The construction of this infrastructure also comes with the donation of 100 pairs of skates, 100 helmets and 100 hockey sticks for children to use at the facility. The Montreal Canadiens Children's Foundation provides help and support to children in need. Since its inception in August 2000, the Foundation has invested close to $27 million in the community with its BLEU BLANC BOUGE program and donations to more than 755 charitable endeavors working for the well-being of underprivileged children across the province of Quebec. The Foundation fulfills its mandate in two ways: first, through a unique flagship project – the BLEU BLANC BOUGE program - which consists of building community refrigerated and multisport rinks, secondly by providing financial support to organizations whose projects and programs allow children to adopt healthy lifestyles by being more active and eating better. Canadian Tire Jumpstart Charities is a national charity dedicated to helping kids overcome financial and accessibility barriers to sport and recreation in order to provide inclusive play for kids of all abilities. With an extensive, national network of more than 1,900 Community Partners and nearly 300 local chapters, Jumpstart helps eligible families cover the costs of registration, transportation, and equipment, and provides funding to selected organizations for recreational infrastructure and programming. Supported by the Government of Canada through Sport Canada and the Canadian Tire Family of Companies, which includes Canadian Tire, PartSource, Gas+, Sport Chek, Atmosphere, National Sports, Sports Experts, Mark's and Canadian Tire Financial Services, Jumpstart has enabled 1.5 million Canadian kids and counting to get in the game since 2005. 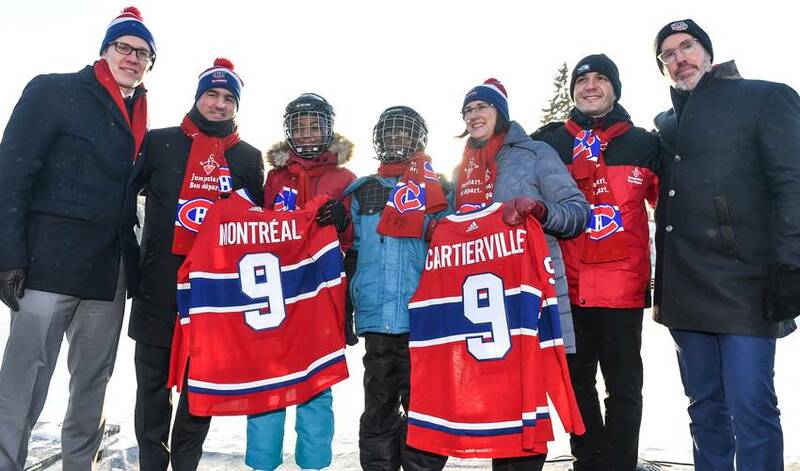 Ahuntsic-Cartierville becomes the sixth Montréal borough to receive a BLEU BLANC BOUGE ice rink from the Montreal Canadiens Children’s Foundation. All youth from this underprivileged area will be pleased to benefit from this refrigerated rink at Parc De Mésy. The ice rink is primarily intended for the borough’s children and youth under the age of 17, with the aim of promoting the advantages of a healthy and physically active lifestyle. It will operate seven days a week. Schools and youth organizations will be able to reserve the rink on weekdays (Monday to Friday) between 9 a.m. and 3 p.m. Free skating and pick-up hockey activities will be offered on weekends and in the late afternoon on weekdays so that all citizens can take full advantage of the new facility. Other sports, such as basketball, may be practiced during the spring, summer and fall.